These fact fluency tasks and worksheets are geared to help develop math fact knowledge for first graders in the first 2 months of the school year. They will work for older struggling students, Autism students, or those with developmental disabilities. There’s an adorable story to read and an easy-to-make student product to accompany subtraction practice. You’ll also get a songbook to help learn those doubles. These fact fluency tasks and worksheets are geared to help develop math fact knowledge for first graders in the months of December to January. They will, also, work for older struggling students, Autism students, or those with developmental disabilities. 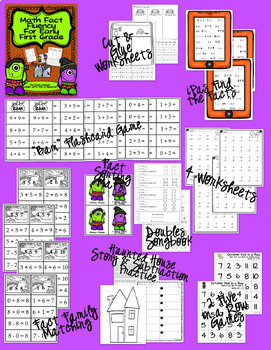 Homework, independent work, Math Workshop, Math Daily 3, and review at later times can addressed with these. There’re two short stories to read aloud and easy-to-make student products to accompany the fact family practice. There’s one suitable for December and one suitable for January/Winter. 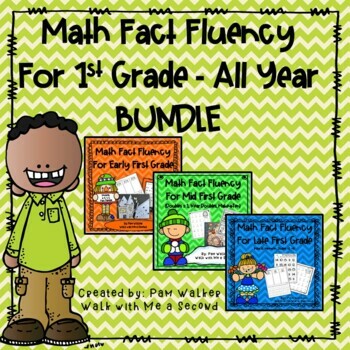 These fact fluency tasks and worksheets are geared to help develop math fact knowledge for first graders in the last 3-4 months of the school year. There are two strategies emphasized and others revisited. They will work for older struggling students, Autism students, or those with developmental disabilities. There’s an adorable craftivity students may make for displaying their knowledge of the Make Ten Strategy. The INDIVIDUAL UNITS are listed below, if you prefer just one of them. ✂️ When possible on any cards you need to cut apart, I made the lines extra wide for ease in lining up for cutting. ❤️ Do you like this resource? Share it with others! ❤️ Keep up with Walk with Me a Second! Click on the green star ★ above to follow my store! New products are 50% off the first 48 hours! Being a follower gets this and other information to you ASAP. ❤️ If you have questions or problems, please contact me through Product Q & A and I’ll get back to you as soon as I can! Thanks so much for taking your time to preview my product!! 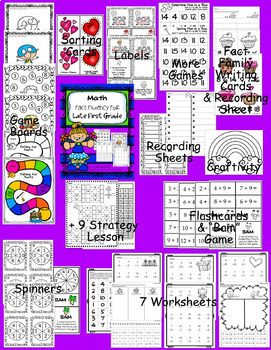 You can find more primary leveled resources in my store. This work is intended for personal use in one classroom only. 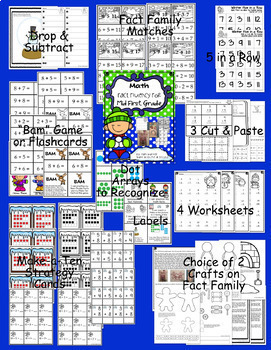 For use in multiple classrooms, please purchase additional licenses.